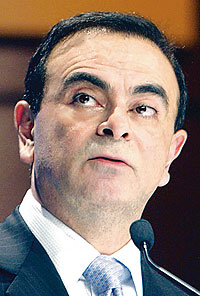 Renault CEO Ghosn: Its a critical time for suppliers. BRUSSELS -- Suppliers are looking for more than 10 billion in loans from the European Investment Bank to help them cope with a growing cash shortage. Supplier executives have been discussing the establishment by the EIB of a new lending vehicle that will specifically aid small and mid-sized suppliers. The EIB is an independent bank owned and operated by the EU. It lends money in support of EU policy objectives. Lars Holmqvist, CEO of CLEPA, the European suppliers association, said suppliers urgently need help as orders have dried up and payments from automaker clients have been delayed. Suppliers also are hurting because banks are raising rates on loans, or cutting back on lending completely. Without assistance, he said, one-third of all European partsmakers could face a crisis within weeks. The health of the supply chain is crucial because 75 percent of the parts in an average European car come from components makers. The EIB has the funds to provide loans to the automotive supplier sector. But officials caution that it doesnt have the infrastructure in place to deal with requests that are likely to come from thousands of small companies across Europe. Arrangements will have to be made with intermediaries and partner banks in each country to make sure funds can be distributed where required. Carmakers have already applied for more than 6 billion in EIB loans. Ghosn, who holds the rotating presidency of ACEA, the European automakers association, said in a speech last week that funds needed this year alone could approach 15 billion.